Flying high somewhere between Italy and Philadelphia, April 2006. Sometimes when things become ordinary I forget how extraordinary they are – like flying on airplanes. It is so easy to get anywhere in the world by simply buying a ticket. It’s so easy that I forget that flight is a relatively new phenomenon. It was only about a hundred years ago that commercial flight became available, and while that may seem like a very long time ago, in the grand history of the world it’s practically yesterday. My immigrant ancestors spent two weeks on a ship to get to America in the early 1900s. I often wonder what they would think about the fact that I can reach their homelands today in about 8 hours. While there have been many, many inventions since they lived and died, I can’t help but think that air flight might be the one that would amaze them the most. Although flights became available in my grandparents’ youth, it was something that only the rich could afford. None of my grandparents ever flew on an airplane. My father took his first flight in his 20s – a very short hop to Birmingham, NY for training for his job. Even though he traveled the world as a sailor in the U.S. Navy, that short flight remains his first and only. My mother has only flown two roundtrips in her life, and the first was not until she was in her early 50s. My brother and I got to experience the joy of flying a bit more often – and, despite the hassles of baggage, security lines and searches, screaming babies, and long periods of waiting and boredom, it is still a joy. My brother first flew courtesy of the United States Marine Corps and has been on several trips on his own since then. My very first flight at the age of 18 was a doozy – a long, crowded, transatlantic charter – to Rome, Italy! I didn’t know any better at the time, but looking back with more wisdom that flight was horrendous with turbulence almost the entire time. Having never flown before, I just thought it was a lot like riding a bus with the bumpiness and I was as happy as can be. It would be seven years before my next flight, but since then I’ve had the good fortune to go on many. My job occasionally requires me to travel by air – some years I’ve only traveled once or twice, but other years I’ve been on a dozen trips. I’ve also been very fortunate to fly for some of my vacations, so over the years I’ve become a rather experienced frequent flyer. But all that time up in the sky or waiting in airports makes me forget just how amazing it is to board an airplane, magically rise 5 or 6 miles up into the sky, and safely land far, far away from my home just hours later. On one work trip, I sat and listened to the flight attendants go through the safety information for what felt like the thousandth time in my life. After a long wait, I just wanted to get where I was going and the charm of being on a flight had long since worn off. That is, until a child seated near me exclaimed, with all of the wide-eyed wonder only accessible to children, “Look, it’s a tiny table that opens up!” As he squealed with delight at the discovery of the tray table, I had to smile myself – yes, this flying thing and everything associated with it is pretty amazing, isn’t it? While my trip to Rome was exciting because it was the first, and a vacation to California at age 25 was exciting just because it was a vacation to California, it was a flight when I was 28 years old that gave me a different kind of euphoria – it was my very first flight alone. I was flying to Denver, Colorado to meet friends flying in from elsewhere. To this day, I remember waving good-bye to my father and walking through the security checkpoint – and at that moment, I felt a sense of exhilaration and broke out into a large smile. I was about to fly somewhere I had never been, I was all alone, and I thought it was the most wonderful feeling in the entire world! As I said, my job has required me to take a fair amount of flights. I’ve experienced some very long ones and the longest was a trip to Seoul, South Korea. I think it took about fifteen hours, and I was very blessed that I was allowed to take First Class (a rarity in Government travel unless the flight exceeds fourteen hours!). The shortest flight I’ve ever taken is a tie between either Norfolk or Boston – both are about 20 minutes in the air. However, one flight to Boston was so bumpy due to bad weather that it actually felt longer than the trip to Seoul! I also had a very short flight from somewhere in Florida to Pensacola, and an encounter with turbulence almost sent the world’s tiniest beverage cart flying down the aisle towards my center-of-the-back-row seat. A U.S. Air Force C-130 military transport plane. Taken at Schriever AFB, Colorado Springs, CO in February, 2003 as my teammates board the plane. My friend Leona and I aboard the C-130, February 2003. Another military flight was far different, though. I was in a leadership program with about 50 other civilians from around the country, and one week we had to fly to several locations in North Dakota, Alaska, and Tennessee. 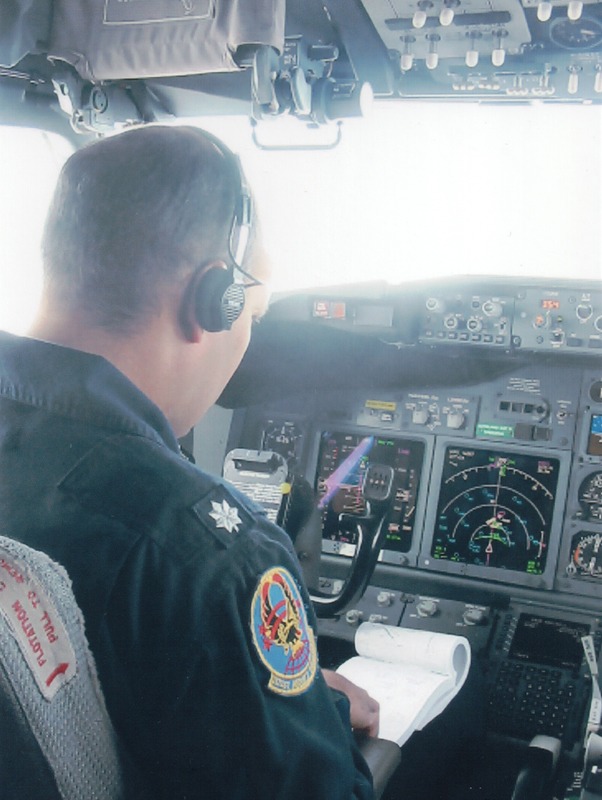 Rather than attempt to get commercial flights for all of us, we had a jet at our disposal piloted by a flight crew of National Guardsmen. Since we had the flight all to ourselves, they were the most enjoyable flights I ever took. And I even sat in the cockpit part of the way from North Dakota to Alaska! Now I know for a fact that pilots have the best view of all. This was way, way better than flying on a C-130! The pilot was cool, but he wouldn't let me fly the plane.... Taken somewhere between North Dakota and Alaska, April 2003. The view is one of my favorite things about flying. I have seen many awesome things from the air, and they are no less impressive at that height. In fact, they were likely more impressive as seen from up above than from on the ground. My first and only view of the Grand Canyon so far was from a plane about 30,000 feet in the sky – and even at that distance, I could not believe how big and beautiful it is. Similarly, I had never seen the Mississippi River before – except from the air. I did not realize how big it is – and if it looked big from that high up, it is definitely wider than I ever imagined. Other awesome sights from the sky include the Norfolk Bay Bridge Tunnel where you get an incredible view of the disappearing road as it goes underwater – and then reappears. I’ve seen a close up view of the skyscrapers of New York City, and I’ve even flown over Citizens Bank Park during a Phillies game. The single most incredible sight was during that “private” flight to Alaska. The pilot was granted permission to take the plane as close as possible to Mt. McKinley. It was a beautiful, clear day and the pilot announced that he was going to take us for a closer view. The friend next to me and I were leaning over in our seats to look out the window. “Is that it?” he asked, pointing to one of the mountains. I didn’t know. “Maybe,” I said, “it looks pretty big.” We were looking down at some mountains trying to determine which one Mt. McKinley actually was when suddenly this massive mountain appeared next to the window at eye level. In fact, we had to look up to see the top of it. We both said simultaneously, “Wow – that’s it!” I’ve seen many mountains from the air, but I have never seen anything quite as big as that one. Mt. McKinley from the sky...awesome! Taken in April, 2003. What’s my favorite view from the sky? I have two. First, I love looking out and seeing a brilliant blue sky and a carpet of clouds. I know that everyone below those clouds is having a cloudy, dreary, and rainy day. But from my view, the sun is shining! It reminds me that life is all a matter of perspective, and sometimes from a 30,000 ft. view things don’t seem quite as bad. Next, my favorite site is the view as the plane approaches home. It is fun to go away, and amazing to see beautiful sights from the sky. But I really feel like I’m flying high when I come home again. My ancestors never got to experience the wonder of flight – but did they feel that same “coming home” feeling when they saw America for the first time? The following article first appeared on July 25, 2009 for my The Humor of It…Through a Different Lens column for Shades of the Departed. footnoteMaven has graciously allowed me to reprint my Humor of It articles here on What’s Past is Prologue. I’m currently on hiatus writing this column for Shades, but I encourage you to visit the latest edition of the digital magazine (The Mourning Issue) for some excellent writing and photography! “The Fotomat was a little shack, usually in a parking lot of a shopping center, and you would drive up to the window and drop off your film to get developed.” I explained this with the sincerity of a lesson on Ancient Rome or the Civil War. Suddenly I was nostalgic for that little blue building with the yellow roof that sat in the middle of the parking lot of the supermarket. What I remember most about the Fotomat experience is the one thing lacking in today’s digital world – the anticipation. One of the best things about digital cameras for me is the ability to instantly see your shot on an LCD screen. Instant gratification! As great as this is, and as useful in photography, sometimes the things worth waiting for were better. Well, maybe not better – but different. And there’s something to be said for that anticipation! I began taking photographs with my own camera at the age of 11, and since you couldn’t see them as you took them (unless you had a Polaroid, of course), it was always interesting to see how your photos “turned out”. Or in some cases, what was on that roll of film. In your family, did you ever find a roll of film in a drawer that appeared to be used, but no one ever knew what it was from? Well, all you had to do was drive up to the window at the Fotomat, drop it off, and wait a day. You’d get to see your pictures when you picked them up! I was fascinated by these little huts. Did they actually develop the film in there? How? If you worked there, what did you do when there were no cars in line? And how do you fit a bathroom in there? 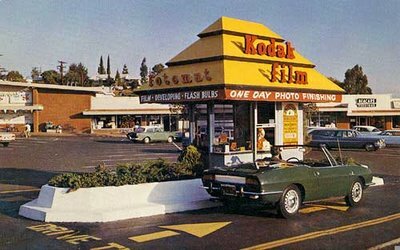 The first Fotomat drive-thru kiosk opened in the late 1960s in Point Loma, California. By 1980, there were 4,000 sites throughout the country. Customers could receive their prints in one day, but when the first film developers began to offer prints in one hour, Fotomat was doomed. It’s ironic, because today I would have assumed that the thing that killed it – 1-hour developing – would have made it viable. After all, in the 21st century people like to spend more time in their car than at home. They can buy and eat breakfast, visit the bank, pick up prescriptions, get lunch, buy some groceries, get the car washed, drop off their dry cleaning, and pick up dinner without ever leaving the car. So why wouldn’t Fotomats work today? Drop off your memory card and pick up your prints in an hour! I think it would work, but the shacks were too small – especially for film developing, which was a more complex process than printing digital photos today. By the mid-1980’s, the familiar huts were gone. The one I used to use was torn down long ago, but in some cases the huts were recycled into other uses from selling snow cones to cigarettes. 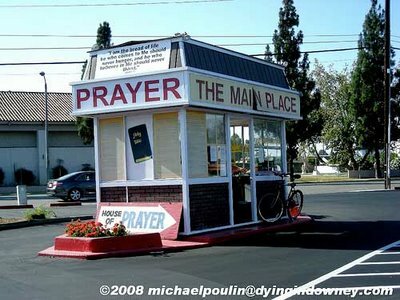 The most creative re-use I’ve found so far is as a chapel! Imagine that – a prayer shack! That would be a lesson for another day – let’s go take some photos instead! When it comes to family pictures, we rarely look at the “rest” of the photograph – that is, other objects appearing in the background with our smiling faces. But sometimes when my family looks at photographs from our younger days, we’ll comment on a particular piece of furniture, or the wallpaper, or some appliance that brings back memories. Just as unlabeled photos don’t tell the whole story to future photo viewers about who’s who in the picture, those objects in the background often have stories behind them that are not usually told. 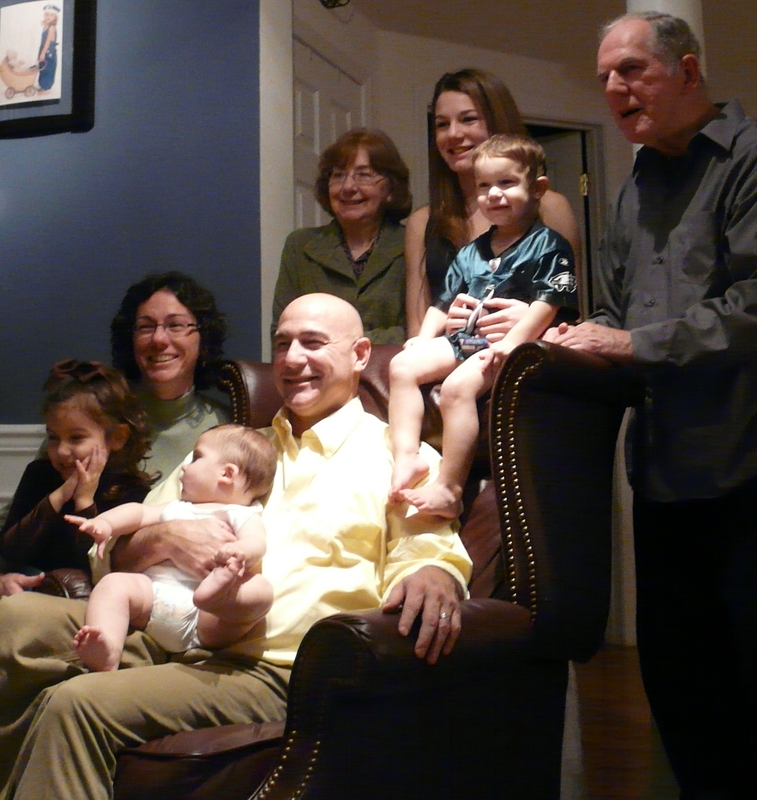 One object that appears in our family photos over the last several years is a chair. It looks like a nice chair: leather, wingback, regal-looking. But, if you know the whole story, it’s more than a chair. I’d describe it to my nieces and nephews as The Chair that Almost Killed Your Mother and Me. My brother originally bought The Chair. When he moved in with his then-fiancée, the chair moved with him. But their condo was rather small, and their new house was in the process of being built. Since I had just purchased a house, lived alone, and owned little furniture, I had some room to spare. Could I hold the chair at my place until the house was ready? It seemed like a good idea at the time. After all, it was a nice chair and not ugly, and I had the space. My brother is tall, fit, and muscular, but he must have been busy that day, so he sends my future sister-in-law over to my house with the chair. She’s 5’2″. I’m taller, but probably weaker. It was up to us ladies to get the chair settled into its temporary home. Getting in the door wasn’t a problem, but it overwhelmed my living room and the other rooms on the first floor still had unpacked boxes. But then I had an idea. We’ll call this the Critical Error. Where I really wanted the chair was up in the bedroom – we can get it upstairs, right? In order to adequately describe the events that followed, I have to digress from the story with a description of the layout of my home. The upstairs – a master bedroom, bathroom, hall, and some closets – used to be the attic of the house. The former homeowner renovated and added a stairway in the best place possible, which wasn’t necessarily the most convenient place possible. The stairs are narrow, and there is no banister on the “open” side. Lacking all sense of reason, my future sister-in-law Alleah and I decide to carry the chair upstairs. I grabbed the top end and backed up the stairs, while Alleah lifted the up the other end from the lower stairs. This worked well…for about five steps. The chair didn’t fit up the stairs. Let’s ignore the fact that neither Alleah nor I owned or heard about a thing called a “tape measure”. We were stuck. I tried to maneuver around the stuck chair to help from the bottom end, but in the process I lost my grip. In what would have scored a 10.0 in the Olympic Comedic Stupidity Event, I performed an amazing partially controlled falling leap over the side of the staircase, rolling over and landing on my back in the middle of the living room floor. Even a Russian judge would have given me a high score for that spiral leap. Even though it hurt, I was laughing hysterically. Meanwhile, back on the stairs…the Killer Chair followed gravity in the proper downward direction. Unfortunately, Alleah was in that direction still trying to hold on to the chair. As I lay laughing, her own laughter at my predicament quickly turned into the realization that the Chair had pinned her to the wall at the bottom of the stairs. Naturally, as I also realized this, it made me laugh even harder, still laying on the floor. To this day, Alleah remembers that I had a photograph of Pope John Paul II on the stairway that, in her teary-eyed state of laughter, appeared to be staring at her mockingly from the safety of the wall. Now, this was truly a crucial event in my sister-in-law’s life, for the Chair was attacking her in the region that would become the womb to my three future nieces and nephews. If we had filmed this event, we’d have more hits on YouTube than Susan Boyle. Eventually, I was able to move, but it took the strength of both of us to move the chair, and Alleah was still laughing too hard to be of any help to herself. We swear The Chair did it on purpose in retaliation for being moved. Well, needless to say, it never made it to my bedroom. After regaining our composure, the chair was unceremoniously thrown down the stairs into my basement, where it remained until their house was ready for it. When it had to be moved again, the move was wisely handled by my brother and her father. We had enough of The Chair, with bruises and scars to prove it. We find it rather ironic that today the kids have another name for The Chair: Daddy’s Prayer Chair, for it is where my brother spends his prayer time. Little do they know the history behind the chair and the other names it has been called by their mother and their aunt. What untold stories lurk in the background of your photographs? A family portrait around The Chair, years after it tried to kill me and my sister-in-law. She was wisely keeping her distance from it by taking the photograph instead. Like scores of tourists before me, I was discovering the beauty of the Côte d’Azur. I was on vacation, it was sunny, and Nice was as beautiful as everyone said it would be. But it was hot, and sometimes you even need a break from vacationing too hard. After walking the promenade and the narrow streets of Vieux Nice all morning, a sidewalk café beckoned. Although the meal itself wasn’t memorable, the sense of relaxation brought on by food, wine, and pleasant weather was. So we lingered to enjoy the light-headed buzz of wine in the afternoon, the so-very-French annoyance of the waiter, and the throes of tourists meandering down the alley that was masquerading as a major thoroughfare. Breaking the peacefulness was the arrival of two white-haired British ladies good-naturedly complaining about the heat, the French in general, their tour group, and each other. They collapsed into the empty chairs next to ours, and since this was Europe, the empty table was approximately one inch away. This forced intimacy at European cafés makes it impossible to either maintain your own privacy or try not to eavesdrop on your neighbors. The ladies, as much in need of a rest as we were an hour before, ordered some tea. As the waiter left the table, one of the women griped about the sorry state of tea in France. “Oh, I do hope it’s not dreadful like that tea this morning. You just cannot get a good cup of tea here,” she snipped. We became fast friends. The ladies were from Northern England and were spending a long weekend in Nice with a tour group. We were in the middle of my first trip to France, with the Riviera sandwiched between a visit to the Rhone area and Paris. They joked with us about not understanding the Scots’ English; my friend regaled the ladies with his stories of living next to a farm in New Jersey. Her friend shook her head and spoke up in a much louder voice usually reserved for addressing the hearing disabled or others who don’t speak your language. “No, dear, he said NEW Jersey,” she yelled. The four of us laughed loudly, making our ever-hovering waiter wince. After the ladies finished their tea, they wandered back down the street trying to find their long-lost tour group. They were a comedy team in motion. We never exchanged names, and we didn’t capture the moment with a photograph. But their humor and joie de vivre certainly captured our hearts. It doesn’t take many years of living before you realize that everyone has some unique aspect to their personality. Whether you call that trait an idiosyncrasy or a quirk, it is some small characteristic that seems perfectly normal to oneself, but it will drive others insane. Houses can be a lot like people They also have unique personalities – and those quirks that come along as personality baggage. In fact, houses have rather forceful personalities – you abide by the house rules, or else. That’s the only way a house will work. The house in which I grew up, and where my parents still live, has plenty of unique little oddities. If walls could speak, the other houses on the street would have called ours names. If you got to know our house’s personality, you would have definitely called it a “freak”. The house had several things about it that were strange, but because we lived with these weird things and got used the house’s behavior, its peculiar personality seemed quite normal to us. For example, the oven wasn’t like “normal” ovens, but it was through no fault of its own. The house, which was built in 1961, had a gas wall oven. In those pre-digital days, the temperature was controlled with a round dial. One day, sometime during the 1960’s, my father decided to be helpful. (Ladies, we all know what happens when men try to be helpful.) Dad was determined to clean the kitchen, and he chose a rather powerful cleaner (likely ammonia). My father proceeded to wipe once around the oven’s dial to clean the surface. By the time his finger completely circled the dial, he noticed that he not only removed grease, but the ink that labeled the dial with the various temperatures. Which is why I grew up without the knowledge that ovens had actual temperatures; I thought you just turned the knob until it got hot. Because this original oven stayed with us until I was an adult, the question when baking something was never “What temperature?” but “What time?” My mother’s answer would be “twenty of” or “half past,” for we imagined the dial as a clock to determine the approximate temperature. Of course, we never really knew for sure if “twenty of” was really 300° or 350° since we were relying on my mother’s memory of the original, unmolested dial, but that never stopped us from cooking. Over the years we’d always muse that we could simply go to a neighbor’s house and make a tracing of their dial to ensure we had an accurate reading, for all of the houses on the street were built with the same appliances. But I suppose it was much more fun to take a wild guess. And since my mother was an excellent cook, her memory of that dial must have been rather good – we never burnt anything in the oven! But, now that I mention it, almost every time we used the oven, the smoke alarm would go off – just another little personality trait of the house. Our kitchen was strange in other ways, too. The electrical system for the entire house seemed to be located on one circuit breaker – the kitchen’s. In the summertime, we had one air conditioner in the kitchen window and one in the living room window to cool the first floor. There were rules associated with the use of those air conditioners – not parental rules or the laws of thermodynamics, but house rules. For instance, using the air conditioner while the television was on meant that you couldn’t make a piece of toast without turning off something first. Using the microwave? You’d better hope that there weren’t clothes in the dryer or you would have to wait. Using the toaster and the microwave and the coffee pot all at the same time? Dear Lord, do not flip that light switch on or the whole house would go dead. Looking back at these things now, I can’t believe we lived with the idiosyncrasies that could have been easily fixed. In the same house today, there’s a new oven with a spiffy digital keypad where you can actually set the required temperature. The house also now has a central air conditioning unit, which required a new circuit breaker system, so the entire house is no longer routed through the kitchen. But where’s the fun in everything working as it’s supposed to? The house may no longer be called a freak, but without the goofy oddities it also lacks charm. Now I live in my own house, with its own creaks and sounds and issues. I know what the temperature is for the oven, but after all these years I still have light switches that work something but I know not what. And please, if you visit, don’t dare flush the toilet if someone’s in the shower! My memory for today’s edition of “Memory Monday” is forever linked with the feast of Pentecost, which is celebrated in Christianity next Sunday. Not that this memory actually happened on Pentecost – I can’t even remember when exactly this event happened. But every single year I sit in church on this feast and listen to the readings. And every year, I can’t help but break out into a huge grin during the first reading. The smirk is unstoppable; I just can’t help it. This is the story of my secret smile. To some this story may seem irreverent, but I’ve always thought God has a sense of humor. And if He does, He was likely laughing along with me all those years ago. When I was between the age of 20 and 24, I had a certain group of friends. We called ourselves a “prayer group” and we were a mix of single and married 20- and 30-something Catholics. Each Saturday night, we would gather in each other’s homes for an evening of singing and charismatic prayer, which was followed by socializing and fellowship that cemented our friendships. We were a loosely defined group of 15 to 25 people. Some people came and went, some were always there, and occasionally invited guests or friends would expand us into an even larger group. One Saturday night, one of our larger crowds gathered in Debbie’s basement apartment. We usually spread ourselves around the room in a circle, using all available sofas and chairs as well as the floor. Fortunately, Deb’s living room was large enough for at least 20 of us to gather comfortably. There was no agenda to our meetings; sometimes we would sing – several members played the guitar for accompaniment, sometimes we would read from the bible or share a story, sometimes we would pray loudly, and sometimes we would sit in silence. Usually we would do all of these things in the course of our “meeting” – as the spirit moved us. This particular evening, a quiet came upon the group and we all sat in silence either praying or thinking. In this deep silence, one member of our party – I will call him Harry (not his real name) – had the embarrassing misfortune to… Well, there are a lot of ways to say it – “broke wind” or “passed gas” – he farted. Rather loudly, and the surrounding silence made the sound seem even louder. Harry was clearly embarrassed, and he apologized to the group as he blushed a deep shade of red. To our credit, we remained silent. After all, we were adults. But, while silent, we were each desperately trying to keep our eyes on the ground and away from each other. The sheer humor of the event was simply too much for our friend Sue. She could no longer stifle a laugh and let out a loud cackle. One laugh was all it took – the entire group exploded with laughter. As it turns out, farts are as funny to adults as they are to toddlers, and the fact that we were all supposed to be “seriously” praying made it even funnier. This group had several people with what I call “contagious” laughter – if you heard their laugh, you’d laugh even harder. We laughed until we all had tears streaming from our eyes. Every time we tried to settle down, someone else would begin laughing again. A shocked calm settled over the group. I, for one, was surprised that Tim, of all people, would bring us back into seriousness and lead us back into prayer. He had us at “wind”. We laughed until our sides hurt, and the “prayer” meeting was officially over for the evening. Thanks to Tim – and Harry – for making me smile every year at Pentecost! The telephone was born in 1876. Despite some minor modifications, the technology generally remained unchanged for more than a century. Then, without warning, phones became…different. Nothing makes you feel older than realizing a technological change that occurred in your own lifetime. Suddenly you can “remember when” and people ten or twenty years younger than you cannot. In last week’s “Memory Monday” about our address book, I mentioned telephone exchanges – the first two letters of a word that was used for the number-equivalent (Pennsylvania 6-5000 was PE6-5000, or 736-5000). But I was surprised at how many other things related to telephones that are different today. For example, I recently watched a movie made in the late 1980’s. Since I was in college at that time, I wouldn’t necessarily consider a movie from that time period to qualify as a “classic” film, but one aspect of the movie made it seem more outdated than things in films from the 1950’s. In the movie, the main character was trying to navigate across the country to meet a deadline, and he continually had to call and check-in as he met obstacles along the way that delayed him. Because cell phones weren’t prevalent back then, he kept stopping at pay phones and phone booths to make the calls. Today I couldn’t find a phone booth if I tried! When I was in 3rd grade (1975-76), the telephone company – for there was only one, and her name was Ma Bell – sponsored a contest for students to design the phone of the future! We had to draw a picture of it and briefly describe its features. The majority of our designs focused on one of two ideas: a phone that you could carry with you, and a “video-phone” that allowed you to see who you were talking to and vice versa. I can’t remember who won or what the prize was, but we had fun designing these future phones. Imagine taking a phone with you in the car! It was pure science fiction. It is amazing how far we have come in such a short time with mobile phones and video-teleconferencing over the internet. But it didn’t happen overnight. Take, for example, my very first “mobile” phone in the late 1980’s. I didn’t really want or need one, but my mother was fascinated by the concept of being able to call me and discover my whereabouts wherever I was. Thank God GPS tracking came into being well into my adulthood. So, she invested in a mobile phone. Well, the word mobile is relative. It could be carried with you, but definitely not in your pocket. The phone was in a very large carrying case (around 8”x10”x4”), weighed at least 5 pounds, and the receiver was connected to the heavy base with a cord. I felt like a Secret Agent with a spy phone, but an agent that was too low on the totem pole to get the good Bond-esque equipment. But it worked, and it was a novel idea at the time. That first mobile phone seems as ancient today as rotary phones did in my childhood. My very first paying job was working in the church rectory answering phones and the door in the evenings. In the beginning, 1981, the rectory had a rotary phone. I don’t remember if we ever had one at my house, but I had to have used one before since I knew how it worked. What I wouldn’t give to have one installed in my house and ask my 14-year-old niece to dial a number for me…her exasperation at the slow dialing pace would be priceless! The phone also had a cord, so she would find it unbelievable that I had to get out of my chair to answer it (I won’t even attempt to explain life without a tv remote to her). Funny! They still make toy rotary phones! This is my nephew Luke, Christmas 2009, wondering what the heck it is. I guess even the fact that I had a job answering the phone would be a quaint idea today thanks to answering machines. In my childhood, an “answering machine” would be defined as someone other than the person you were calling writing down a message. The only machine-voice I remember hearing on the telephone was when you would call the official number at the phone company to hear the correct time or the weather. I wonder if they still have these lines operational now that the internet has taken command and control as our sole information source. One technological improvement that took some fun out of the telephone was Caller ID. The suspense is now gone – we know who is calling before we answer the phone. And someone knows when we are calling. This feature has taken away a fun pastime of our youth – making prank phone calls. I never made such calls myself, but my brother and his friends made some hilarious calls to unsuspecting strangers. Today, they would be busted thanks to Caller ID. So would scores of lovelorn souls who would get up enough nerve to call the boy or girl of their dreams only to hang up when the Dreamboat actually answered – or Dreamboat’s father. I’m not that old but I remember when you got a busy signal because there was no call waiting, all phones were “landlines”, and there was no need for a “Do Not Call” list. But I’m young enough to remember my parents talking about changes in their own lives that involved the telephone. The biggest change? Neither had a telephone in their house while growing up. My father remembers that the only telephone in the neighborhood belonged to the corner drugstore. When it rang, the owner would send him or another boy to run to the house of the call’s recipient. The boys would sometimes get a nickel as a tip, but the calls were often “important” news such as a death in the family, so it wasn’t a fun task to report the news of a call waiting. You are probably younger than me if you’re scratching your head wondering what all of these things are. To find out, Google the terms on your G3 mobile device and text the answers to your blog or Facebook. Or you can actually pick up the phone (please, not while driving) and call one of your old relatives to find out! If you use the term “address book” today, people immediately think of that “thing” in their email program that stores email addresses. Or maybe they think of that other “thing” on their cell phone that stores phone numbers and names. I’m young enough to use the latest technology, but I straddle the gap between “now” and the seemingly old-fashioned generation of our parents. So I’m also old enough to remember when an address book used to be a real bound book full of people’s home addresses and phone numbers. The address book was actually a great source of humor in our house. Not when we first began to use it – what’s so funny about a book of full of phone numbers? But the humor came later. Much later. You see, we started a family address book when I was young – and although we updated some of the information over the years, we never really updated the entire book. Fast forward to 20 or 25 years later, when my mother would retrieve the book to find a phone number. As she paged through the book, a particular name would catch her eye. “Who’s Julie? Or Ralph?” she’d ask. “Julie or Ralph? I have no idea,” I replied. “They’re right here – in the book,” my mother would insist, as if being in the book would mean I automatically knew everything about the person, akin to your “permanent record” in Catholic school. Naturally, my father would have no idea either. In those cases of Unknown Individuals Listed in The Book, we had to assume that someone entered our home while we were out, found the address book in the kitchen hutch, and entered Julie and Ralph’s names and numbers as a joke. I suggested calling Julie or Ralph to find out who they were. “We can’t do that!” my mother replied. “Why not? Someone in this house knew who they were at some point!” But we never called the mysterious strangers listed in “the book” – none of us were curious enough to find out who they really were. Because if we found out, one of us would have to admit to forgetting who these people were. Many entries would get crossed out over the years, but we still kept the same book. After all, it still had empty pages to fill so it was perfectly usable. My mother wasn’t always the questioner either – sometimes I would look through the book and ask her if a number was still needed. “Why? The doctor that took over still has the same phone number.” She had a point. Of course, we knew the number by heart after calling it over the years, so there really was no need to write it down in an address book because we never needed to look it up. Contrast that scenario with the present, when we never actually dial a number because they’re programmed in the “speed dial,” which makes it difficult to remember even the most frequently called numbers. Sometimes entries were crossed out because the person had died. It always felt rude to cross the name out in the book, as if by leaving the entry as-is you could still call the person to chat. It seemed better just to leave it there, and for many years we did – a reminder of old friends. Many of the older entries in the book had “old time” phone number exchanges in which letters were used for the first two numbers. In my neighborhood, the phone numbers began with either 632- or 637-, but instead of “63” we’d say “NE” which was phone-code-speak for “Neptune”. I’d always laugh when my father would recite a phone number as “Neptune 7-1234” or “Mayfair 4-9876”. It amused me because it seemed so old-fashioned, a la Glenn Miller’s “Pennsylvania 6-5000.” But now that we don’t use those exchanges anymore I miss them! Today there are so many phone numbers that you have to dial the entire 10-digit number including the area code just to call within the city of Philadelphia. My grandfather, Henry Pater, in the 1950 Philadelphia City Directory. His telephone exchange was "FIdelity". As its name implies, the address book also contained addresses. These were primarily used for Christmas cards, birthday cards, or invitations as well as the occasional letter. The striking thing about this is that the addresses and phone numbers never needed to be updated. My parents’ friends lived in the same houses throughout my entire childhood – and they all still live in those houses and have the same phone numbers today. My own address book (yes, I still keep an actual book) has many scratched out addresses and arrows drawn to new entries as friends move or marry. The entries all take up much more space now as well. We no longer have a single phone number, but a number for home, cell, work, work cell, as well as email addresses for home and work. The ways to reach someone seem endless, yet it is rare today to talk to someone on the phone when they aren’t busy doing something else at the same time. The irony is that there are many ways to reach out, but you never actually make the connection. One day when I was in my mid 30’s, we decided that “the book” was ridiculous since 85% of the entries were for businesses that no longer existed, people who had died, or friends we “unfriended” years ago. Not to mention the papers and business cards stuffed inside of it that either my parents or I were too lazy to record in the book. So I did something I never dreamed possible – I gave my mother a new address book. It seemed a shame to throw the old one out unceremoniously after all the years it had spent living in our kitchen hutch, but, in the end, that’s what we did – only after the “good” numbers and addresses were dutifully transferred. Too bad that old book couldn’t speak to us. If it could give some final words before departing our lives, we would have finally found out who Julie and Ralph were! Wikipedia has an interesting article on Telephone Exchange Names that explains why I remember them – Philadelphia hung on to the old style exchange names until I was in high school in 1983. If you had the opportunity to walk to and from school as a child, chances are you remember that walk quite well. My house was located rather close to the church and school – just about a quarter mile away. As a young child, my mother drove me to school. But as I grew older, I was allowed to walk all by myself. Since the school was within a reasonable walking distance to all of our homes, we walked home for lunch, then walked back for the rest of the day. The walk was seven minutes at a reasonable pace (longer when my legs were shorter), four times a day. The satellite view of my walk home from Point "A" - my grade school - to Point "B" - the Pointkouski home. Courtesy of Google Maps (street names removed). Even in high school (a slightly longer walk at one mile), I still walked back and forth to the grade school to either hang out, help out, go to church, or work at the rectory. The distance may have been close, but during those years I must have walked the equivalent of hundreds of miles repeating that simple quarter mile. The walk wasn’t especially scenic – just a bunch of other houses of various shapes and sizes. Despite the relative simplicity of the walk, or perhaps because of it, my mind is occasionally flooded with fleeting memories of that walk home. We always remember the important events in life, but how often do we take time to remember the mundane, everyday, ordinary things that are part of our lives? I have two favorite memories of walking home during winter. The first was when I was around 12 years old and in 6th grade. Back then I only wore eyeglasses for looking at “the board” in school (I was tall and always seated in the back of the room) and for watching television. One cold day I must have fumbled with my eyeglass case – in part because some girls in my class passed by and teased me about something or other. I remember dropping it, then quickly picking up my belongings and running the rest of the way home. Later that night, I put on my glasses to watch tv , and a lens was missing! I remembered where I dropped them, so my father decided to walk back to school with me to find the missing (and costly) lens. By now, it was after dinner and very dark outside. It started snowing as we walked to school. “Where did you drop them?” my father asked. I replied, “Somewhere along the fence!” It was true – that’s where I dropped my school bag. But the fence was about the length of a football field…or two! My father patiently shined a flashlight as we searched and searched in the falling snow, but the lens was never found. We laugh about it to this day! Years later, my friends Louie and Joe walked me home after evening Mass on another snowy, winter night. For some reason we were quite exuberant that night, and we did something out of the ordinary as we walked the quiet, deserted streets – we sang at the top of our lungs. I don’t remember the song, but we had quite a ball singing our out-of-tune melodies walking arm in arm through the falling snow. Snow wasn’t the only weather-related walk home that made an impression on my memory. One summer day I was walking home, probably from helping out at the summer day camp, when it started to rain. Not just any rain, but a summer torrent as if God turned on a fire hydrant. About half-way home I ran into my neighbor from across the street – he was walking home from the bus stop after work. We began running together. After about a block, we both stopped and started laughing…we were soaking wet. Realizing it was futile to try to outrun the rain, we just laughed at the situation and strolled the rest of the way home. My favorite season of the year for the walk home was spring. I don’t have any specific memories, but when I think of “the walk home” I remember spring, when everyone’s windows were open to let in the fresh, warm air. What I remember were the sounds I’d hear as I walked: dishes and silverware clattering as dinner tables were set, voices talking or yelling, children playing, babies crying, and televisions or radios broadcasting. Sounds of families, sounds of home, sounds of life. As I searched my memories, I realized that most of my remembrances were of the walk home from school or church, not the walk there. Home! My mother was always there – and my grandmother, too. Dinner was always in process – and we always ate together as a family as soon as Dad got home from work. It was always warm – especially in the winter when my glasses would fog up going from cold to warmth. The cat was always waiting for me, although he wouldn’t dare show it. There is a saying which says you can’t go home again, but I think you can. One day this spring when I visit my parents, I’m taking a walk up to my old school – just so I can walk home again and remember how wonderful that feels. Do you remember your walk home from school?